Recently, I was commenting on the quality of Stoneboat Vineyards’s Pinotage to one of the proprietors of another winery. Obviously, the wineries making Pinotage in British Columbia have work to do, to say nothing of South African wineries, since the grape is a product of South African viticulture. So here is a little primer, with a little help from Wine Grapes, the comprehensive book on varietals from Jancis Robinson et al. The variety was created in 1925 by Professor Abraham Perold, the first professor of viticulture at the University of Stellenbosch in South Africa. Another viticulturist spotted the plants and took them to a nursery at Elsenburg Agricultural College, where he grafted some plant material to rootstock. He showed the plants to Perold who encouraged him to propagate them. The best of the four plants became the mother block for what became Pinotage. The name was also created by Perold and a colleague. It is simply a contraction of Pinot and Hermitage (the name then given to Cinsault in South Africa). The first commercial planting of the vine at a winery occurred in 1943. However, it was not until the 1959 vintage that any winery there released a varietal Pinotage. More than a generation had passed since Perold’s experiment. In fact, Perold died two years before that first commercial planting. Developing grape varieties is a task for the patient. Today, there are 15,000 acres of Pinotage in South Africa, with just modest acreages in Brazil, New Zealand, California – even in Zimbabwe and Israel. In British Columbia, it is grown primarily by four vineyards. In the 2013 vintage, Pinotage production was 250 tons, putting the variety a surprising eighth in volume of red varietals, just behind Malbec. Yet that was still a mere 1.58% of the total red grape production. One can understand a winery owner not having heard of Pinotage. Several factors limited the variety’s expansion beyond South Africa. Firstly, the vine was susceptible to viruses. In time, the growers there developed healthier plant material. Secondly, South African Pinotage wines sometimes (too frequently in former times) had aromas of nail polish remover, with off flavours going along with that. This was thought to relate perhaps to virus damage, or perhaps to heat stress at harvest or perhaps to overly hot fermentation. The South African vintners have overcome that problem in the last 10 or 15 years. I have never encountered that fault in an Okanagan Pinotage, by the way, but, some years ago, I had a few from South Africa that not pleasant. 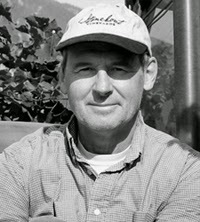 The Okanagan’s first Pinotage vines were imported by Paul Moser, a South African businessman who moved to British Columbia in 1994 and established Lake Breeze Vineyards two years later. (Moser sold the winery in 1998.) Now, Lake Breeze has 100 or so cases of Pinotage that is eagerly awaited by its fans. The plant material that Moser brought from South Africa was propagated for him by Lanny Martinuik, an Oliver grape grower and nursery operator. Lanny was intrigued with the variety and tissue-cultured enough plant material for a significant planting by the time his family opened Stoneboat Vineyards in 2007. The View Winery in East Kelowna has an 8.5 acre block of Pinotage, probably the single largest planting in the Okanagan. Those vines were imported independently by one of the winery’s owners. The winery makes good Pinotage and Pinotage Rosé. There probably is a fourth block of Pinotage on one of the Osoyoos area vineyards operated by Constellation Brands. Inniskillin Okanagan released several vintages of Pinotage in its Discovery Series but appears to have discontinued doing so. Whatever issues there may have been over the years with Pinotage in South Africa, the variety performs well in the Okanagan, judging from the wines. One vintage of Stoneboat Pinotage even won the Lieutenant Governor’s Award for Excellence in Wine. I had a fine encounter recently with Stoneboat Pinotage 2012. I had been asked to pair wines with the dishes at a dinner party where the centerpiece was a loin of pork. Pinot Noir being out of the budget, I suggested one of my favourite Gamay Noirs. I had considered the Pinotage but thought it risky because so few consumers know of it. The hosts did a test run ahead of time and were underwhelmed by the Gamay. So was I when I tasted it again. So I lined up several Gamays and the Pinotage and the latter won hands down. At the subsequent dinner, the wine was received with general acclaim. The lesson is screw up your courage and try a bottle. In fact, try other Stoneboat wines as well. This is very fine family winery. Here are notes on some recent releases. Stoneboat Pinot Gris 2013 ($18.90 for 1,100 cases). The wine begins with aromas of citrus and peaches. On the palate, there are flavours of peach and apple, with a touch of orange. The texture is generous and the finish lingers. 89. Stoneboat Chorus 2013 ($18.90 for 1,350 cases). This is a complex blend of Pinot Blanc, Müller-Thurgau, Schönburger, Kerner, Pinot Gris and Viognier. The wine has aromas of fruit, herbs and spice, leading to flavours of citrus, apples and herbs. The finish is crisply dry. 90. Stoneboat Verglas 2012 ($54.40 for 375 ml). This is the proprietary name for this winery’s Icewine. The first time the winery made Icewine, they had forgotten to register the grapes before harvest, as the rules require. So they created the name Verglas and the wine has been so well received that they continue to use it. The grapes here are Oraniensteiner and Pinot Blanc. The wine has a glorious honeyed aroma of peaches and pineapples and this is echoed on the palate. The bright acidity provides a refreshing and tangy balance to the natural sugar. The finish is clean and ever so long. 93. Stoneboat Pinot Noir 2012 ($24.90 for 1,100 cases). This begins with toasty oak aromas mingled with cherry. On the palate, cherry and strawberry flavours mingle with spice and very subtle oak. The texture is silky. 88. Stoneboat Pinotage 2012 ($24.90 for 1,000 cases). The wine begins with aromas of plum and black cherry. On the palate, there is a core of berry flavours, including lingonberry, blackberry and black currant jam. Silky tannins give the wine a long finish. 91. Note also that Stoneboat has made both a reserve Pinotage (Solo Pinotage) and a Pinotage Icewine. Imagine all of the above flavours concentrated in both wines.